Zhik’s innovative new Isotak®,‘modular’ ocean racing gear, has swept the board to win the METS DAME Award clothing category. For the second year in a row, Zhik’s R&D team have impressed the DAME jury by disrupting the norm and bringing offshore sailors a totally new approach to ocean apparel design. The new Isotak® X Ocean range will be available in retail outlets from December 2017. Isotak® X is the result of extensive development work with the Dongfeng Race Team and team AkzoNobel who are currently using the new ocean range in their quest to win the Volvo Ocean Race 2017-18. Key developments include the new Hydrovision™ hood featuring a clear, ‘see through’ visor, an ‘Adaptive™’ hood and collar on the Isotak X Ocean Smock and Drysuit enabling the entire hood-collar unit to be inter-changed with different balaclavas for different weather conditions, plus an enhanced Reziseal™ system for the neck and cuffs. Designed to enhance the sailors’ field of vision, the new Hydrovision™ Hood also gives an extremely high level of protection. Hydrovision refers to the new hood visor, a rigid clear polycarbonate that provides incredible peripheral vision and protection from spray. The visor can be positioned to cover almost the entire face. The hood and collar features Zhik’s innovative PFD compatible shaping that avoids bulk around the neck. The hood seaming is sited above where a PFD sits, rather than stitched into the back of the collar seam, which can cause discomfort and neck strain over long periods. The collar also features a removable and adjustable face shield with Hydrobase™ thermal fleece lining. The Hydrovision hood and visor sit neatly behind the head so it is easily accessed and deployed with one hand. The visor does not stow away in the collar, however the new Zhik Adaptive hood and collar can be entirely removed from the Isotak X Reziseal Smock and Drysuit. 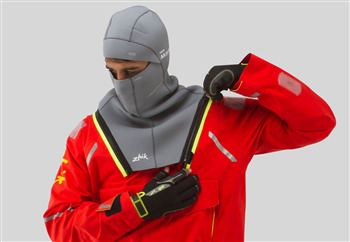 Zhik have developed a compatible Neoprene Balaclava and an Avlare® Balaclava which can be zipped onto the smock and drysuit. The Avlare Balaclava is made from Zhik’s unique, lightweight, water-shedding fabric, making it the ideal head protection when conditions are warm and with a lot of wind and spray. Both the Neoprene and Avlare balaclavas offer full-facial protection with nose shaping to enable comfortable breathing. The neck and cuff seals feature the new Reziseal system with improved comfort and durability. Made from a polyurethane and high stretch textile composite fabric that is constructed into a soft, highly stretchable waterproof seal, they are worlds apart from the sticky latex seals that are prone to perish and wear out. Other innovations in the Isotak X range include the jacket’s dual zipper system. In addition to the main zip, there is a separate ‘relief’ zipper, that is easy to access and operate in a big sea and can be operated one-handed, enhancing safety and meaning the crew still have one hand for the boat. The garment construction has been optimized on all the Isotak X styles to reduce the total quantity of seams, which in turn reduces weight and bulk while also allowing critical seams to be reinforced to improve durability. The jacket and smock have a longer cut for increased protection. The Isotak X Salopettes include pre-loaded knee and seat pads for protection and insulation, which can be removed. The inclusion of a waterproof YKK® Aquaseal® zip on the Salopettes means the inner gusset has been made smaller, for easier access and significantly reducing fabric bulk as well as weight. The new Isotak X range is made from Zhik’s proprietary Isotak® fabric, which has been proven to be four times more ‘durable waterproof’ than other ocean fabrics. The Royal Melbourne Institute of Technology (RMIT) has independently created a testing process that simulates and accelerates the intense wear and tear waterproof fabrics get on board race boats. Pressure tests are carried out on each fabric over defined intervals during this wear process. Using the new testing methodology, Zhik’s Isotak fabric has consistently proven to be substantially more waterproof durable than the current market leading PTFE ocean fabric. Additional RET breathability tests show that despite the significantly higher waterproof durability of Isotak fabric it has comparable breathability to competitors products.